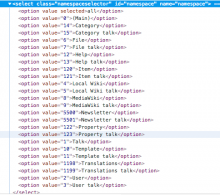 The list of namespaces to search across is listed numerically by the namespace index number. When designing interfaces for humans to use, list things alphabetically if no other priority is given. A suggestion would be to keep "all" and "(Main)" at the top and order the rest in alphabetical pairs (Namespace/Talk). This goes the same for Special:Log, Special:RecentChanges, and Special:DeletedContributions. It would be a huge drop in convenience to, taking examples from @CKoerner_WMF's image, scroll past Grants, Research, Participation, Iberocoop, Programs, Schema, CNBanner, Translations, Gadget, Gadget definition, and Topic just to get to something useful like Userspace. Even within the core of 0-14, it's more useful to have User and Projectspace ahead of items like File, Category, MediaWiki, Help, Template, and Category. 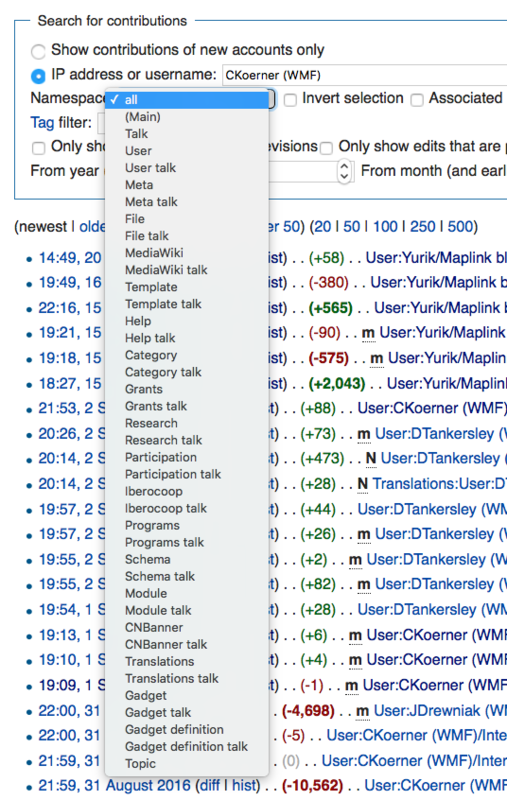 Finally, separating out Mainspace from Talk would be incredibly unhelpful, especially for new users. 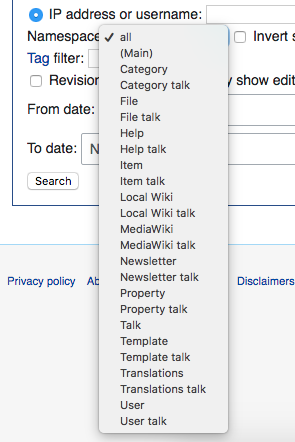 We want to encourage use of Talkpages, not dump them below MediaWiki and Portals away from their associated namespace. @Amorymeltzer, basically, the algorithm I used just checks if "all" and "(Main)" is available and reserve their positions, then sorts the rest alphabetically but keeps their values (namespace constants - integers) in tact. @CKoerner_WMF, I guess that is the requirements of this task and does it make sense @Amorymeltzer? So any other namespaces should be sorted without any problem. Taking into consideration HCI, I think users can easily figure out their target input from an alphabetically ordered list rather than a random list of items, I say this because I've been a victim many times but not sure of other users. matmarex added subscribers: He7d3r, RoySmith, MZMcBride and 2 others. I thought that this can't possibly be the first time this is proposed, searched, and found the two duplicates. :) There was some discussion there (and also semi-relevant discussion on T176992, about the dropdown on Special:RecentChanges only). I think one argument for keeping the current order (by namespace id) is that it is consistent across all languages. 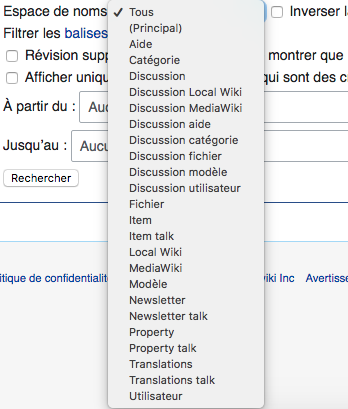 As someone who is occasionally asked to debug weird issues in various languages, I find it very convenient to navigate the interface without being able to speak the language it's written in. 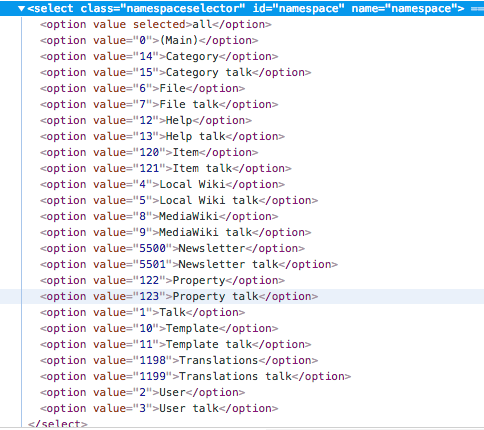 (Note that the namespace names are in the wiki content language even if you switch your interface language.) This is very much a minority use case though (probably only relevant to developers and stewards). 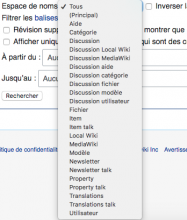 In some languages, the dropdown will be "grouped" by the name of the main namespace, while in others it will be "grouped" by talk vs. non-talk namespaces. I am not sure if this is a problem, but it feels weird. Also, if you're sorting alphabetically, you have to sort according to the rules of the given language. For example, in Czech (cs), the namespace "Šablona" (Template) should be ordered after "Soubor" (File) and before "Uživatel" (User). The currently proposed patch will put it at the end of the list. In PHP you can use the Collator class for this (but you'll have to have a fallback in case the 'intl' extension is not available, since we don't actually require it right now). @matmarex, results are consistent. Not sure if I can test for every language but this seems to work. Krinkle added a subscriber: Volker_E. I suspect that this cannot be solved or improved by something as simple as a plain alphabetical sort. I can imagine various other approaches that could work, but I think we should let the experts from Design share their thoughts instead. 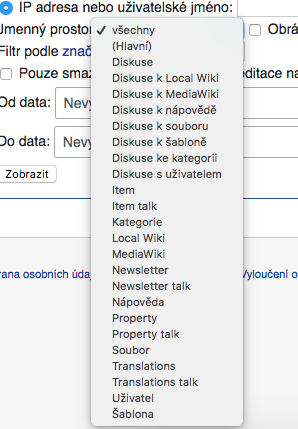 That Čeština screenshot shows it is wrongly sorting all Discussion pages together (Diskuse*) rather than using pairs of namespace/talk as stated in the description. Also, I would contend that it is better to show them alphabetically. 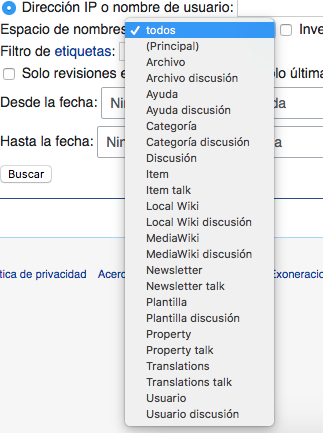 For instance on eswiki, listing Archivio: (File:) at the beginning is useless, since that it's not used at all (only Commons uploads are allowed). Sorting by usage so most common namespaces to filter by appear first would be more useful (although the sorting will seem arbitrary). The very least, I would put the content namespaces at the beginning. And probably next Help and NS_PROJECT. I'm not convinced that this is a good idea, but if this is going to be done, I think talk namespaces should be directly after the corresponding subject namespace. That is, always pair the talk namespace with the subject namespace as suggested in the task description. I'll leave it to Design to make better decisions on this than me. Čeština with the patch (F28242342) has an odd grouping of a bunch of talk namespaces near the top. Regarding the sort order, per the comments in previous tasks, I think it'd make the most sense to sort by usefulness or some other goals of the project. Clearly mainspace should prioritized, but then isn't interaction with other users important? 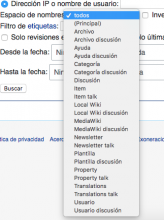 Why should we prioritize MediaWiki over Projectspace? I don't want to get into a slippery slope argument, but I think differential sorting, with 0-15 (although perhaps also 100+101, 118+119, and 828+829) ordered by some internal preference and the rest alphabetical(ish) below, makes enough sense if this is destined to go forward. Per above messages, it would be better for a design discussion or decision to be made on this before further work continues. Once a direction is agreed upon, implementing it would not be an overkill. So far, the comments are gradually scoping to a direction but let the experts speak on this. Removing self as assignee till a direction is agreed upon and if the pending patch should be continued.